There Are So Many Reasons To Celebrate!! Read this fascinating book to learn more. We want to celebrate equality for all and on International Women's Day, we especially want to bring to your attention some of the amazing things that women around the world have done to help society move forward in positive ways. Today, all of our classes found out about at least one famous woman and how they have added to the world. All of our girls in Y5 spent the morning at Gateshead College as part of the college's Careers Day, looking particularly at the opportunities there are in technology. Some of them also brought their work on 'friendship and self-confidence' to a close by performing dances that they had choreographed for themselves (all about the emotions that can often make us feel bad and how we can help one another with them) to their peers. Below you can read about what other things we have done today and who we have learnt about. The word document above gives you some ideas of famous women around the world that you might like to find out more about at home. You might be amazed by some of the things they have done. 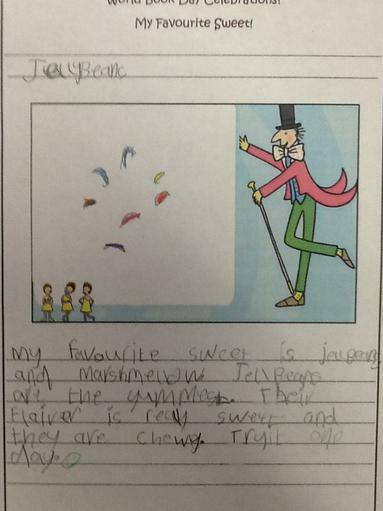 Year 1's work. We learned about Florence Nightingale by watching a video about her life. She was a nursing hero! Read our class report to find out more about her. A young, Muslim woman of today inspiring us all. We have had such a wonderful time immersing ourselves in stories today. 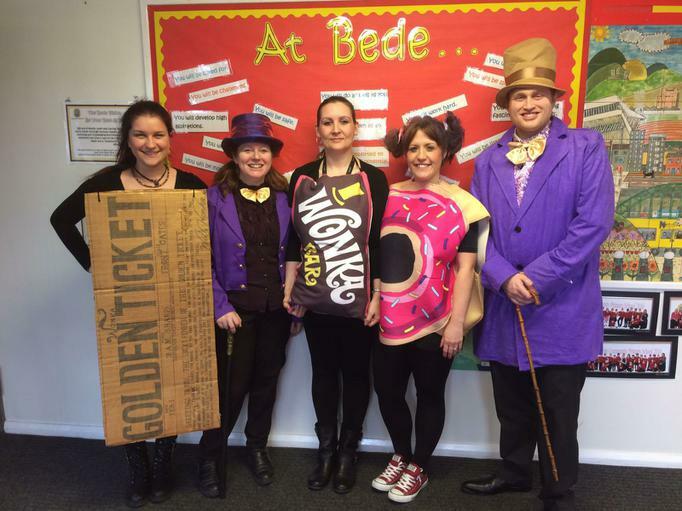 Our theme was Willy Wonka and The Chocolate Factory by Roald Dahl, and our lessons were all based around this wonderful story. 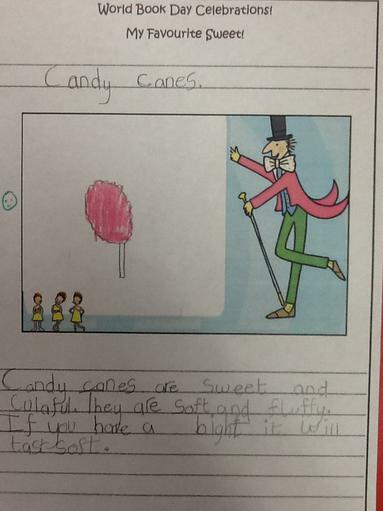 Some of us did science experiments involving chocolate, others designed Willy Wonka Cushions in design technology, and absolutely everyone in school wrote about sweeties!! Our display, including the new sweets we've designed (like Y6's 'Sweet Dreams') and the descriptions of confectionery we all know, will be up in the hall for you all to see next time you are in school. Which sweet thing do you think ' colourful clouds of sweet, sticky fluff.' might be describing? 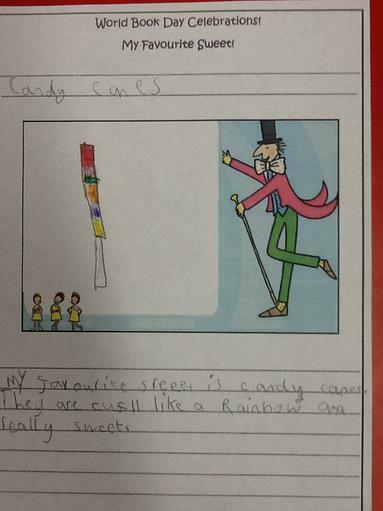 Year 2 could tell you as they thought of this wonderfully imaginative descriptive statement. 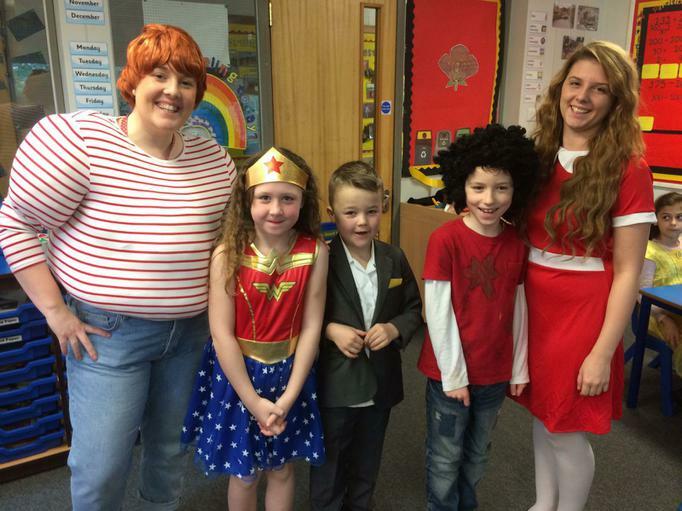 We had a great assembly, where staff and children talked about which character they had come dressed as. 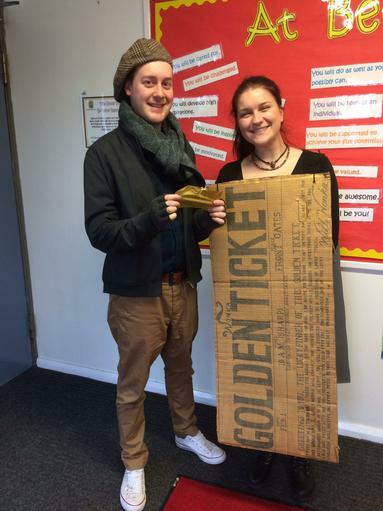 Then, one child in each class had to find their golden ticket as they'd been chosen for making a huge effort with their costume. At the end of the day, the tickets were all put into a draw to win the most chocolatey chocolate cake ever, made for us by our super cook, Carol. One of our families is having a lovely treat tonight. Enjoy it but do remember only a little bit each. None of us want to become Augustus Gloop, do we? 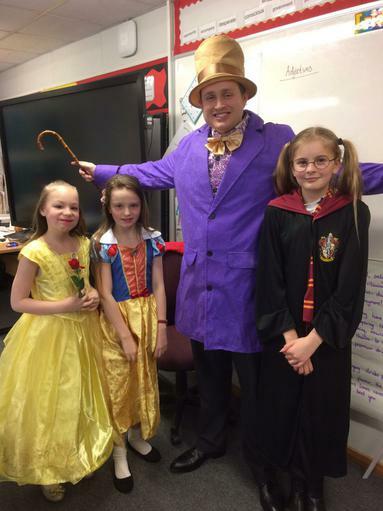 We had a fantastic World Book Day! 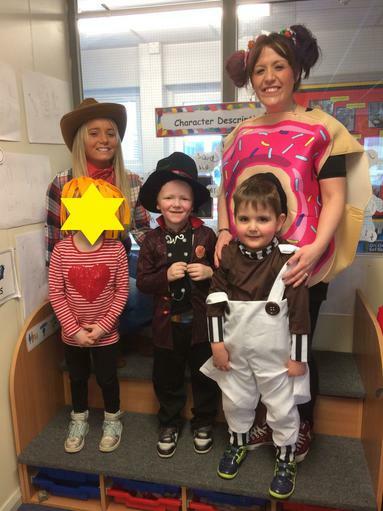 We began with a fashion parade where we presented our outfit to the class and described our character.We loved our Charlie and the Chocolate Factory theme! 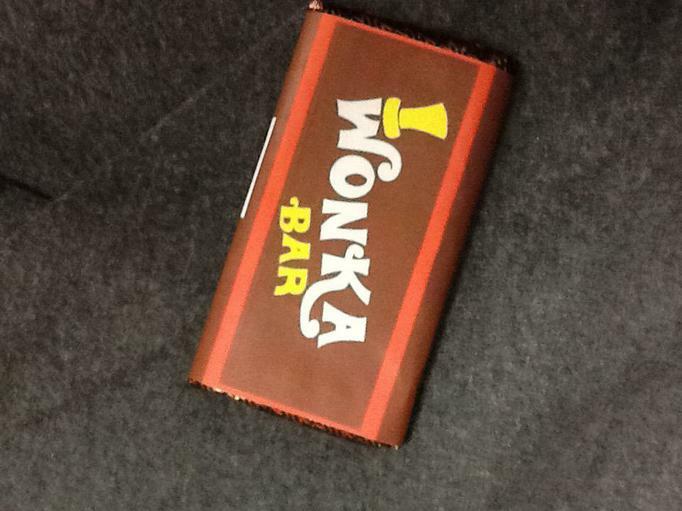 We learned to dance and sing like the Oopma Loompas and tasted a real Wonka Bar! 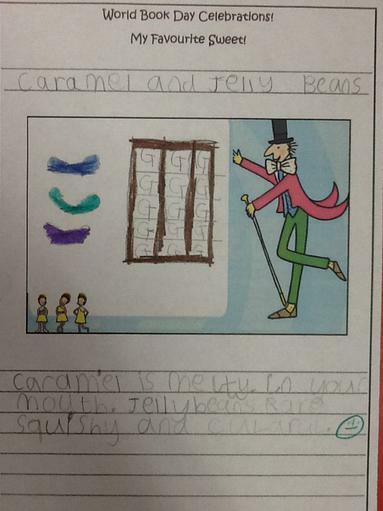 We used adjectives to describe the Wonka Bar and then we wrote our own description of our favourite sweet! They are good enough to make your mouth water!! Read some examples in the photographs above. 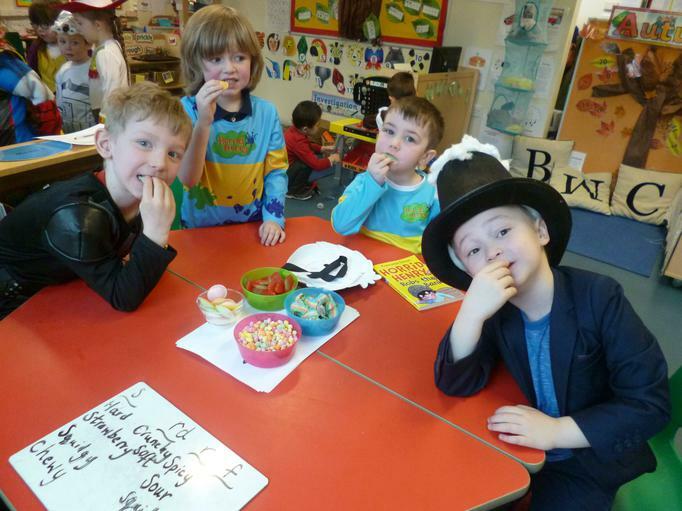 As part of our World Book Day celebrations, we tried different sweets and explored descriptive language to describe them. 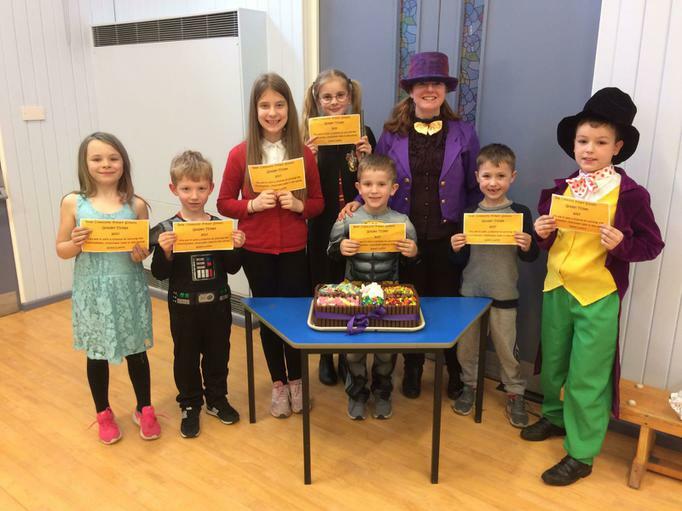 They were truly scrumptious and the writing was fab too! Just look at our photograph above. 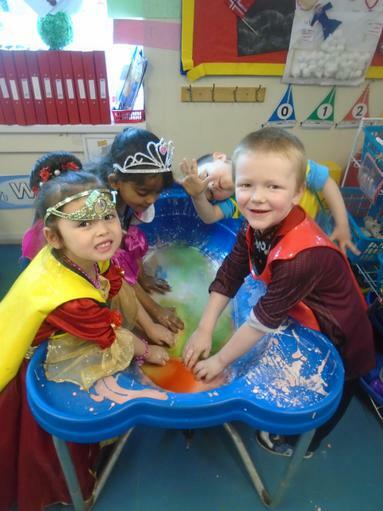 We had fun making a river out of gloop to represent the chocolate river in 'Charlie and the Chocolate Factory' If you would like to make this at home, you will just need corn-flour, water and a little bit of food colouring. It feels amazing! Please note though, it is very messy, so don't wear your good clothes! 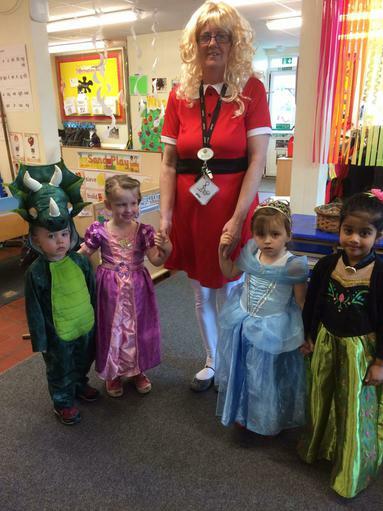 You can see some of our class thoroughly enjoying it! 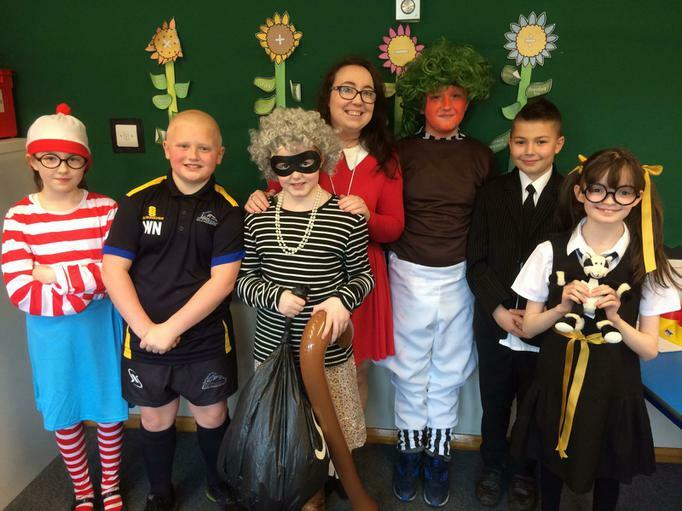 Random Acts of Kindness Week- Red Nose Day! We started this week off by celebrating International Happiness Day, where every class tried in some way to think about what we can do to keep ourselves happy and how we can help to make others happier too. We think that doing things for others is one way to make yourself & others happy at the same time! So, we have tried hard just to do the odd thing for others through the week, not for anything other than because it will make someone else happy. 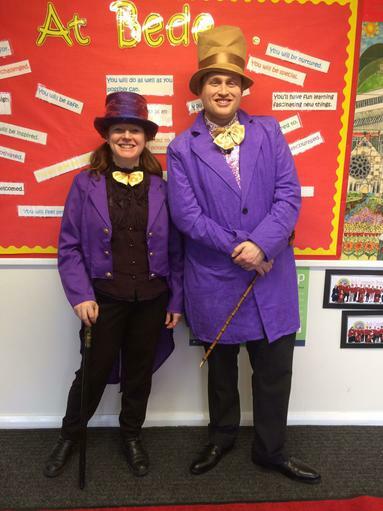 Our final act of kindness is to raise as much money as we can for Red Nose Day on Friday 24th March. We will dress up, buy red nose day cupcakes that we've made during the week & hold a raffle to win a very, very special Red Nose Day cake. It will be a fun day at school, where we think about helping others who are finding life hard here in the UK and in other countries. 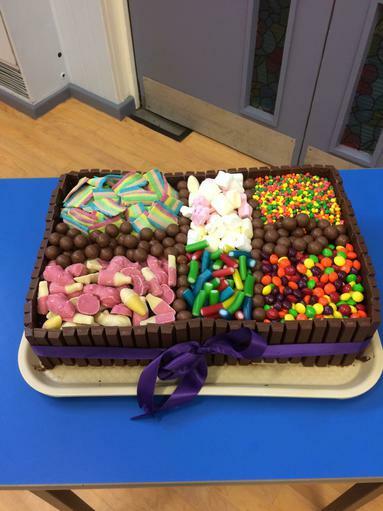 Why don't you buy some raffle tickets before Friday & see if you might win the amazing cake? Go on; it tastes as good as it looks, honestly! Let's Raise Lots With These Spots!